Betta fish tank dividers can be incredibly useful for anyone who wants to keep multiple fish. But if you want to add a divider to your Betta fish tank, there are some things you need to think about. Is your tank big enough? Bettas need at least 2.5 gallons of tank space, and 5 gallons or more is even better. It’s much harder to maintain a healthy and safe environment in a smaller tank, and despite what many pet store employees will tell you, Bettas need room to swim. The next thing you need to consider is what type of divider you want to use. There are a range of options in pet stores and online, or you can make a DIY tank divider yourself. Whatever the size of your tank or type of divider you have, tank dividers do more than just separate a tank into different areas. Read on to discover 7 useful ways to use a Betta fish tank divider and see just how helpful they can be. If you have a Betta tank divider, the best and most obvious use for it is to keep two or more Betta fish in the same tank. Many Betta owners have browsed the fish aisle of their local pet store and stumbled upon a beautiful Betta that they just had to have. But despite what many pet store employees will tell you, Bettas need much more than a small bowl or vase to live happy, healthy, and long lives. Buying a tank setup and getting it ready for a Betta is an added expense and it can be time-consuming. Using a Betta fish tank divider in your existing tank lets you get that second beautiful Betta without having to shell out for a whole new tank as well. While Bettas can and do coexist peacefully with certain fish as tankmates, they have a reputation for aggression and can become territorial if they feel challenged or threatened. You should never put two male Bettas in the same enclosure, and Bettas may be incompatible with other fish as well. If you like to keep a variety of different fish but also want to get a Betta, a tank divider will allow you to keep your Betta in his own enclosure if he’s not getting along with your other fish. That way you can keep different types of incompatible fish without having separate tanks. A proper setup for a Betta fish includes a big enough tank, a good filter for Bettas, and a heater to maintain the tropical temperatures that Bettas need. The cost for all this can add up, but if you use a Betta fish tank divider to keep two Bettas in the same tank, you only need one filter and one heater to create the right environment for both of your fish. When using an HOB filter, make sure that both sides of the tank are being filtered properly, since the divider may restrict some water flow. A good under gravel filter should filter both sides equally. Maintaining an aquarium can be a lot of work. You need to perform water changes regularly, check and adjust the water chemistry, and clean it periodically. If you have two Bettas in separate tanks, you need to do all of this twice. That can eat up a lot of time. Not so if you use a Betta fish tank divider. Tank dividers are porous, so they allow water flow between the two sides of the tank. This means that each side shares the same water chemistry, so you’ll only need to worry about testing and adjusting pH in one tank, and you’ll only have one tank to clean. So you want to start breeding Betta fish? Breeding Bettas can be a lot of fun, and you can even make some extra money selling the beautiful Bettas that you raise. You’ll need a properly set up tank with a removable, transparent divider to separate the male and female before breeding. It’s an important part of the breeding process for the male and female to see and get used to each other before being put in the same enclosure. Once the two Bettas signal that they are ready to start mating, remove the divider and let them start the mating process. If you enjoy playing around with different looks for your fish tanks, using a Betta tank divider can give you multiple canvasses to get creative with your aquascaping. Do you want one part of your tank to look like a zen garden and the other like Mayan ruins? A tank divider lets you do that. And having two different aquascapes side-by-side in the same tank can be very striking. A tank divider also lets you keep a Betta and another fish that needs a completely different aquascaping environment in the same tank. One side can be set up for your Betta, with plenty of plants and hiding places, while the other can be set up for the needs of your other fish. Bettas are jumpers. There are many stories of Betta owners with divided tanks coming home to find that one of their Bettas jumped the divider and attacked or even killed the other fish. If there’s too much of a gap above your divider or if you have a particularly determined Betta, this can be a real risk. As a safety precaution, you can use a Betta tank divider or craft mesh to make a jump guard for your tank. This prevents Bettas from getting to the other side of the divider. If they try to jump the fence, they’ll just hit the jump guard. To make a DIY jump guard, cut a piece of craft mesh or tank divider material into a strip that’s about 6 inches wide. Place it over your tank divider and fasten it to the divider using either fishing line or zip ties. The obvious use for a Betta tank divider is to keep two or more Bettas in the same tank, but they really do much more than that. 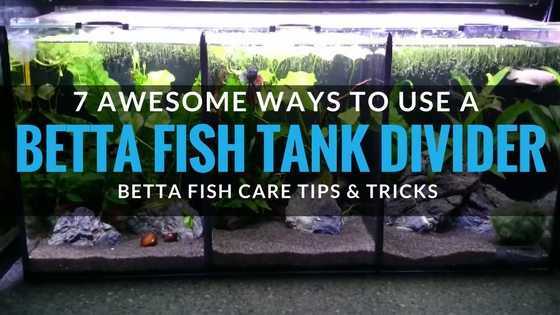 They can save you money and time, simplify tank maintenance, protect your fish, let you get creative with your tank, and even help you breed Bettas. Whether you keep Bettas for fun, as a profession, or just to add a little beauty to your home, using a Betta tank divider can make your life easier and open up a range of different options for your fishkeeping experience.